It’s punk rock gear for your next stay at the mental hospital and/or rehab or maybe a night out at a dank club. 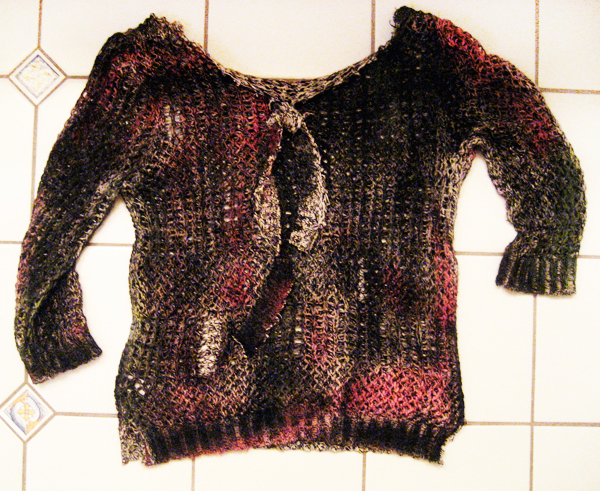 Terribly adorable little cotton sweater, shredded, tagged and chopped to smithereens for a super bad post apocalyptic stance. Colors hard to photograph, but mostly black and metallic silver with neon pink and bits of green… has an almost camo affect. Note, the paint interacted to stiffen the cotton some, but it wears beautifully, comfortably, and is ready to rock. Condition: Wonderfully miserable and full of holes, but that’s the point, no? 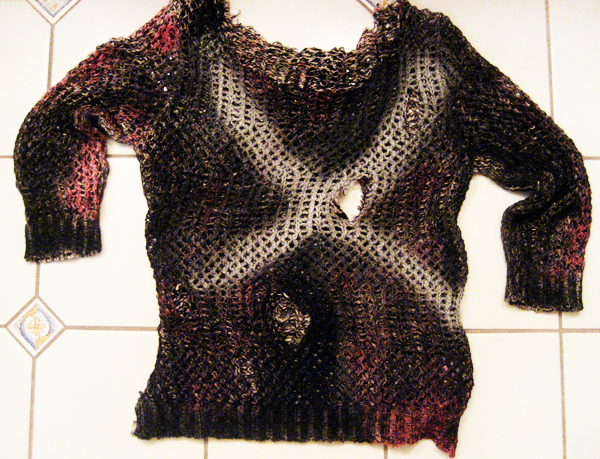 Brand newly purchased sweater was then tortured to the max. 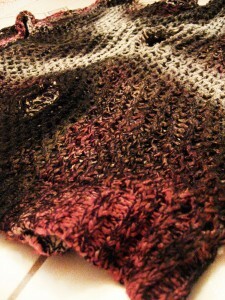 Some unraveling may continue, but probably not too much as the knit seems to lock up well. Shipping: Much harder to estimate shipping on clothing and accessories than jewelry. If you are overcharged by more than $2, I will refund your PayPal account when I get back from the PO. Returns: I want you to be happy and buying clothing/accessories without trying on first can be a challenge. If item arrives and doesn’t fit, AND you email me within 3 days of reciept, I will accept a return. You’ll have to cover return shipping. When item arrives, and providing it is in the same condition as when it left here, I will refund via PayPal minus shipping. Shipping to you will not be refunded.